As the N°1 anti-wart brand in the world, Wartner offers effective and easy to use treatment solutions for the removal of warts and verrucas for many years. 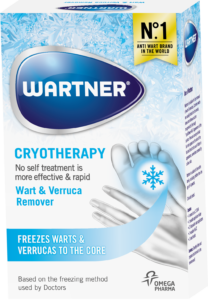 Based on this expertise, Wartner launches two groundbreaking innovations for a fast removal of warts & verrucas: the Wartner Cryotherapy based on the doctor’s freezing method & the Wartner Wart pen based on a unique acid gel method. Next to this, Wartner also provides a new and unique product for the removal of Corns & persistent calluses, the Wartner Corn Pen, and eliminates nail fungus fast with Nailexpert by Wartner. What are the components of the Wartner Corn Pen treatment?